The Marten (Martes americana) is a carnivorous, furbearing relative of the mink. Marten are substantially larger than most mink and other weasel-like relatives. They are found from Southeast Alaska all the way up to the northern and western portions of the state where the last trees disappear and the true arctic tundra begins. Most Marten live in the Interior Alaska forests of stunted black spruce trees and bogs. The Marten's coat is characterized by soft, dense fur which varies in color from pale yellow to dark brown, shading to black on the feet and legs. Lighter-colored Marten tend to have grayish brown tails, while darker animals have dark brown tail fur. The fur around the muzzle varies from gray to light brown with a short dark line extending up the forehead from the corner of each eye. The Marten's throat and upper chest are usually pale or buff or deep orange. The ears are erect and rounded. Marten vary in length from 19 to 25 inches (48-65 cm), not including the tail. They may weigh up to 3 pounds (1.5 kg). Males are considerably larger then females. The tail accounts for nearly a third of the Marten's total length. Marten have sharp, non-retractable claws which they use for climbing as well as for holding their prey. Large furry paws allow the Marten to travel easily over deep snow. Marten are rather solitary creatures except during the mating season. Mating pairs are temporary and the males may have several mates at the same time. Mating occurs in July and August. Fertilization is followed by a period of delayed implantation, during which the fertilized eggs do not develop. After six months the eggs become active and embryos begin to develop, growing rapidly for 2 to 3 months. The litter, averaging three young, is born in April or early May. Young weigh about 1 ounce (28 g) at birth and are covered with fine, yellowish hair. The young Marten's eyes do not open until they are 5 to 7 weeks of age. By early fall the young Martens can forage for themselves. Young normally mate for the first time when they are 2 years old and bear young in their third year. Some females may breed at 15 months. Home ranges of the Marten vary in size in response to population levels and food availability. Males typically travel greater distances than females. One square mile may be sufficient when food is abundant; 15 square miles may be required when food is scarce. Home ranges are exclusive within sexes except during the breeding period. While hunting for food, Marten follow the fringes of spruce thickets along streams or the edges of bog meadows. Movement patterns during these forays are erratic and seemingly aimless. When crossing open swamps, lakes, or bogs, the Marten uses every tree for cover, perhaps for protection from large carnivores and birds of prey. Marten are very courageous, but when pressed closely in open areas they may burrow into loose snow and tunnel for long distances beneath the surface. If snow conditions prohibit burrowing, Marten will climb the nearest tree to avoid capture. When all else fails, Marten will stand and fight. Marten depend heavily on meadow voles and red-backed voles or mice, which are their primary food source over much of Alaska. Fluctuations in food availability often create corresponding variations in Marten populations. This condition is more pronounced in the less optimum habitat of the marten. Probably the second most critical food source is berries, especially blueberries, followed by small birds, eggs, and vegetation. 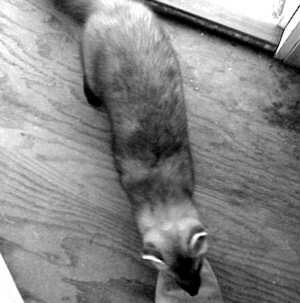 The Marten is a voracious and opportunistic feeder. Carrion such as the remains of wolf kills or salmon carcasses are eaten in many areas. Wild Marten are fond of sweets such as jam. They will sometimes take treats from humans. It has been reported that red squirrels are a major food source for Marten. This does not seem to be the case in Alaska. In fact, the two seem to get along quite well. Marten commonly use red squirrel middens as resting places. Although Marten are suited for nocturnal foraging, they are occasionally seen during the day just before stormy weather or immediately following a fresh snowfall. Marten are widespread and abundant in Alaska. Overtrapping is not a management problem in most areas. Season lengths are set to reduce the opportunity for overexploitation. Contrary to popular belief, wildfires can produce good habitat for Marten by enhancing habitat for small rodents and providing log debris for cover and denning. The Marten or American sable is Alaska's most widely trapped animal and at current prices brings into the state an estimated $1-2 million each year. A trapper may take from 100 to 400 Marten per season, but most average 20 to 30.